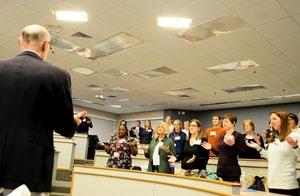 On March 18, 2015, 151 UW Department of Family Medicine (DFM) faculty and staff from 26 locations gathered at the Pyle Center to think big, imagine possibilities and envision the future of the DFM. They were inspired by two innovative leaders in family medicine: Frank deGruy, MD, MSFM, who chairs the University of Colorado Department of Family Medicine; and Macaran Baird, MD, MS, who chairs the University of Minnesota Department of Family Medicine and Community Health. Strategic planning is essential as the DFM expands to become the Department of Family Medicine and Community Health in July 2015. It’s also critical for navigating the rapidly changing local, statewide and national health care landscape. In their presentations, Drs. deGruy and Baird encouraged participants to think beyond the circle of academic family medicine and engage the entire primary care team: advanced-practice providers, pharmacists, behavioral health specialists and medical assistants. “We’re not just training family medicine physicians; we’re training the primary care workforce,” explained Dr. deGruy. They also emphasized the importance of involving patients in all aspects of primary care, from visit length to clinic building design to strategies for delivering care in the community. “We have to reach patients where they are,” remarked Dr. Baird. The rest of the afternoon was abuzz with participants brainstorming ideas in breakout sessions, and offering key questions to the presenters for comment. Each participant also identified the single best idea they hoped to see implemented as the strategic planning process unfolds. In the coming months, the DFM will build on these ideas and others through opportunity conferences, action planning task forces, and a vision conference. “It was amazing to see all of the different members of the DFM coming together to think about the future of our department,” recalled Beth Potter, MD, who is co-facilitating the strategic planning initiative. For more updates, videos and follow ups, visit the DFM’s strategic planning page.